Located in the Glendean Shopping Center on the corner of Glenn and Dean Rd., Chappy’s Deli Auburn offers the Auburn-Opelika area the best in Southern Hospitality with New York Flavor. 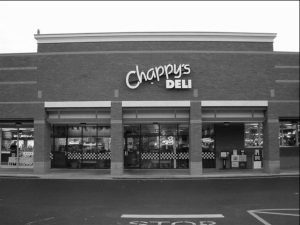 Serving dine-in and take-out breakfast, lunch and dinner, with Auburn-Opelika Area Catering, and free delivery*, Chappy’s Deli is your one-stop breakfast, lunch, dinner and catering headquarters. We also offer free kids meals* all day, every day. Be sure to check out our Events below to see what’s happening at our Auburn, AL location.